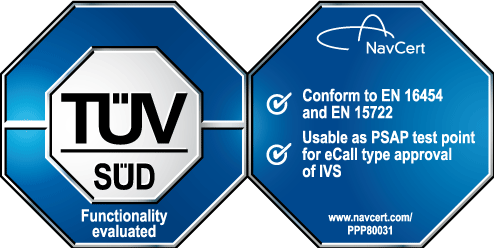 An exclusive cooperation with TÜV SÜD Product Service GmbH enables NavCert to merchandise certifications in the non-regulated area and to assign the certification mark with the TÜV SÜD logo. A certification from NavCert is based on a voluntary test plan which enables us to review outstanding and innovative features of products or services. If the certification was successful the customer recieves a certificate and a double octagon certification mark. The certification mark can be used as marketing tool on data sheets, product packaging, at exhibitions or on your web page. The exact description what has been tested in the context of the certification is provided on the NavCert web page. Furthermore, TÜV SÜD maintains a public web data base where all certificates and its particular certification owner are listed. NavCert’s certification leads to a clear added value which will have a positive impact on the final purchase decision of potential customers. The continuous monitoring by NavCert optimizes the complete value chain additionally. Excellent product development results in higher customer satisfaction. This reduces customer complaints and therefore also costs. Furthermore, liability risks will be minimized since the certification mark is classified as prima facie evidence and reverses the burden of argumentation.